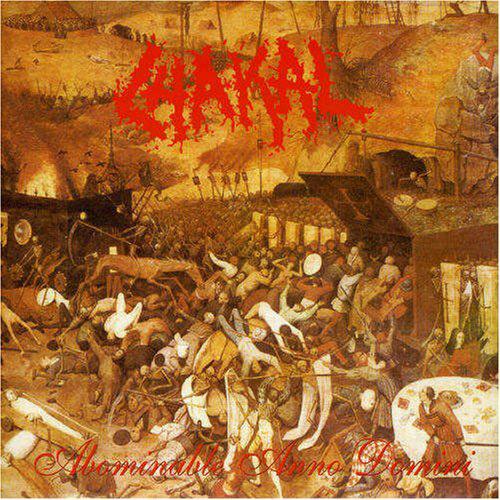 Chakal also took a piece in forming of the South American scene. They were on the side of Sepultura too at it's place of birth, and not surprisingly their music was also on the borderline of related genres. Before they became some sort of weird speed/thrash band, they had a quite harsh debut with "Abominable Anno Domini". It was already a pioneer of death metal too, by including wilder and more exaggerated sound, horror inspired lyrics, and pretty insane vocal style. Their themes were raw all the time, and always suspected some sort of experimenting ambitions of a young band, especially on this first album, but in truth it was simply their own style. This weird style was a creative and genuine approach, and this fits to insanity, which was their returning lyrical topic. The vocals increasing this rampagous sickness, by narrating even to anti-religious and societal critics. 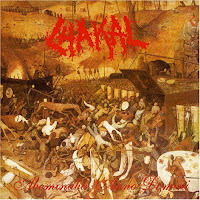 The raw brutality of this album had a big influence on the local scene, and made Chakal it's well known, genre-defining and notorious band.